Try BACnet/IoT – Go-IoT – The one stop solution for your IoT needs! 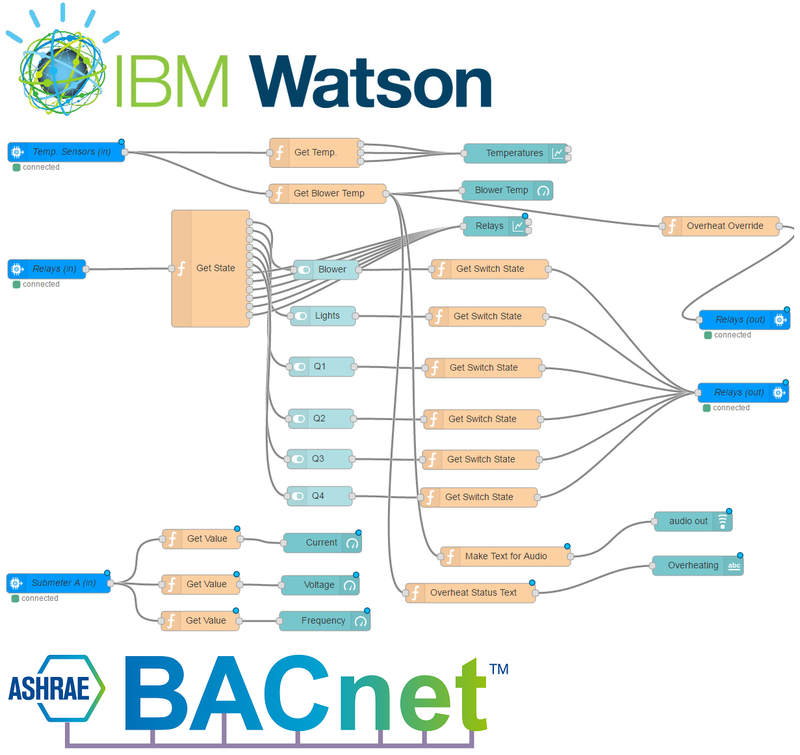 The DINGO BACnet stack includes an app called "BACnet to IBM Watson Gateway". This easy to configure gateway is used to enable MQTT bublishing of BACnet properties to IBM Watson IoT Platform. It also enables commanding from Watson to BACnet devices. Last but not least important, this gateway enables BACnet Web Service requests (BACnet/WS) to be tunneled from Watson to BACnet devices. You can also test a live active dashboard made in Node-RED utilizing this gateway to both monitor sensor values as well as activating a heat-blower, lights, etc. We kindly ask you to not leave the heat-blower on when you are finished. 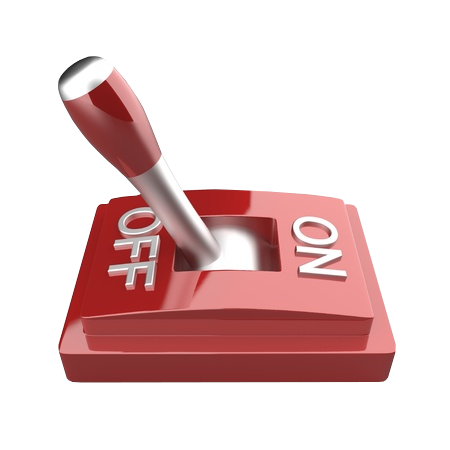 We all want to save energy, don't we? Below is a link to a simple test WEB page. In this simple example you can browse a BACnet network at our laboratory, pick a particular object and subscribe to its COVs (Change Of Value). Try it for example for the temperatures. You can have this web page open at the same time as the dashboard example above and see how those interact with the same physical setup. Study the code and you will soon find out how things are done. 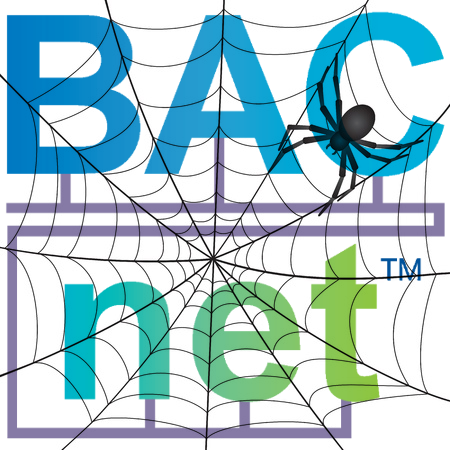 BACnet/IoT implements the cutting edge BACnet/WS part of the BACnet standard. This is very important for extending BACnet to the world of IoT. where ".blt" is a shortcut of ".bacnet/.local/.this" indicating the local device. Notice the ".local" means "the local network" that can be replaced for a network number in a more complex BACnet setup. This is the list of all devices on the local BACnet network. This is the list of all objects in device 104301. Those are all the properties in analog-input with ID 48. Trend Logging is one of the most important feature in many IoT use-cases. We have specialized in Trend Logging for more than 20 years. Therefore we did not leave it out when it came to our BACnet implementation. So let us try retrieving some Trend Logs via BACnet/WS. Note that this can also be done via the BACnet to Watson gateway discussed earlier, using the BACnet/WS tunnel. 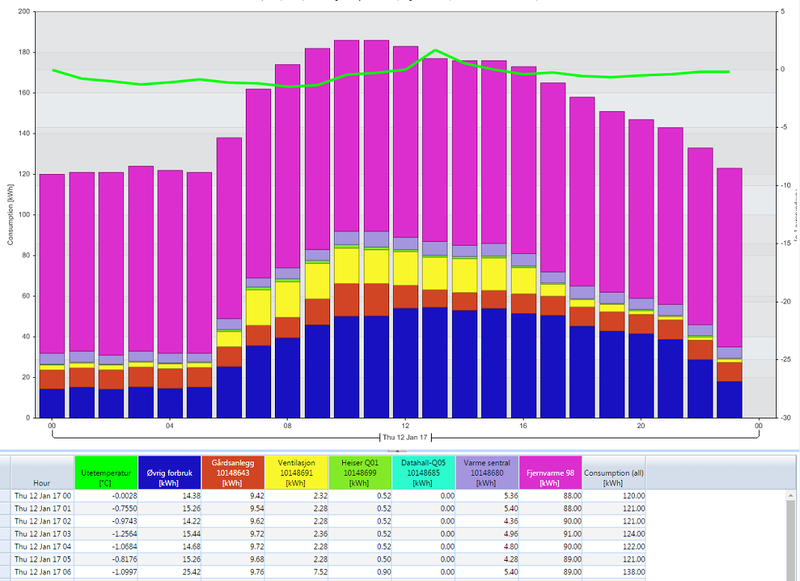 By browsing the network similarly as shown above, you can soon find some trend log objects. For example there some in device with ID 104000 that log temperatures. As you can see there is a lot of properties. Study those and compare to the standard as you like. It is not the intention of this short demo do go into any details here. But in short, this is a an TL object that logs the outside temperature every 15 minutes (at 00:00, 00:15 .... 23:45). Now let us request for logged data from the log-buffer property. This is done with the BACnet Read Range service, where you can do simple-to-complex queries to retrieve logged time-series data. The BACnet/WS query below retrieves the first 100 records after 16th Jan. 2017 00:00. 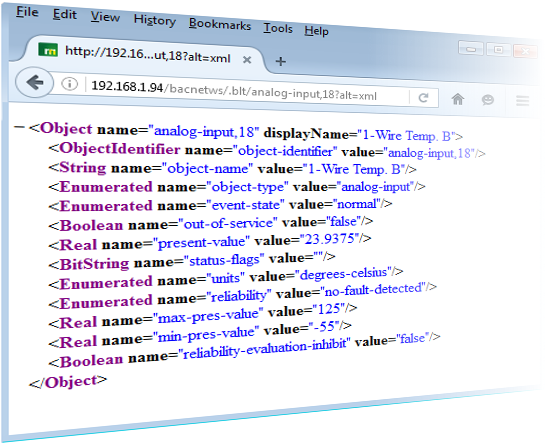 As you can't do PUT request from your Web browser, you need tools like Fiddler or Postman app for Google Chrome, to test BACnet/WS write commands. Or you can code your own program. or this for setting at don't care at the given priority in the path (see for example "?priority=8" in the example path above).